Congratulations! 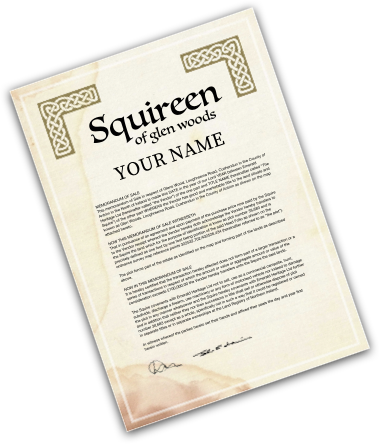 You’re now officially the owner of a small plot of Irish land located in the Glendun Wood! You’re now a Squire, Squiress or Squireen of Ireland. If you’re not, and clicked on this blog out of curiosity or interest, then feel free to click on “Our Story” in the main menu to find out exactly what Emerald Heritage is all about, our hopes and aims, projects and people, and most importantly, the land. Now, to find the exact GPS location of your Irish plot of land, follow the simple steps below. Step One: Open your Internet browser and visit our website www.emeraldheritage.com which should look like the screenshot below. When there click on “My Plot” in the upper right-hand corner of the webpage. Step Two: When you click on “My Plot” you should be direct to a page that looks like the screenshot below. Now, in the empty text field, enter your unique Plot Number under the heading “Locate your Plot”. Step Three: Click the button “Find My Plot”. Step Four: You should now be directed to a page that looks similar to the screenshot below. Congratulations, you now have the exact GPS location of your Irish plot of land! Now that you’ve located your Irish plot of land it’s time to plan the most important thing, your trip to visit the Emerald Isle! If you’re planning to visit in 2018 check out our list of top Irish tourist attractions here to keep you busy, entertained and inspired!